Why do we choose the brands we do? The three year-old begs for Barbie, Tonka, HotWheels – and even the iPad. By the teen years the collection of brands we love and must have explode into the hundreds. As SUP gets more and more popular and mainstream, “brands” and manufacturers for boards, paddles and gear are popping up constantly. What is it about the brands we buy – and what brands should we buy? We don’t have any paid advertising on the Elder SUP blog, instead we think hard about the brands we use. We write about the expertise, passion, commitment – and the people – behind the brands. The brands we choose affect us on functional, emotional and social levels. A good example of this is when I put on my yellow Olukai race jersey. With it on I feel the vibe from the culture of the Olukai Ho’olaulea even on a day like today when I wore it to yoga. It’s a mind-set, a community – and a brand that resonates what it is: OluKai was conceived from a desire to create a better class of products for the life we live in and around the water. That resonates with me. When we propel ourselves powerfully, gracefully and with friends across the water we appreciate the “story” behind our paddle. Not long ago I wrote about the KIALOA Paddles’ new Hulu race paddle. 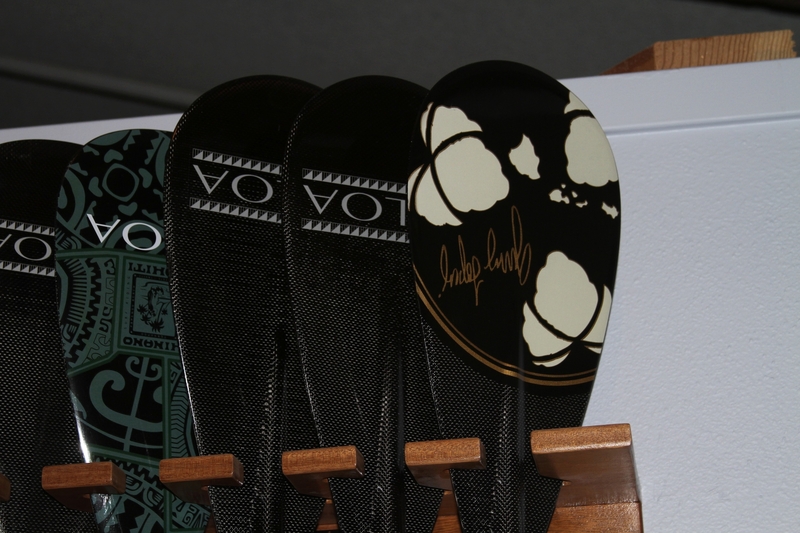 At the time, I had heard something about a Gerry Lopez collaboration with Dave Chun on the design of a GL Surf paddle. Dave and Gerry had many, many conversations about the need for a surf specific paddle. With the very specific design that makes the Hulu series (Light, Ultra Light and GL Ultralight) a great downwind and race paddle, those same specific attributes leave it vulnerable as a surf paddle. The Hulu has fine, sharp edges – ideal for racing – but when it is used for surfing some customers mentioned that their boards were being hit and bruised. Surfers dig, brace and fall on their paddles – a surf SUP paddle has to be designed in its own way. The KIALOA Paddles design of a surf paddle would require beefing it up in the areas where needed and modifying the edges specific to the mechanics of surfing. Here’s where the excellence in a brand and its story come alive! 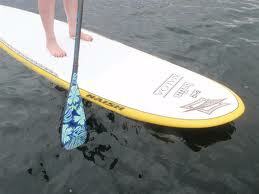 A quick search can lead you to dozens of SUP paddle manufacturers, some of these manufacturers are also designers. Few have the breadth of experience and commitment to excellence, as well as a deep relationship with legends in the sport the way KIALOA Paddles does. 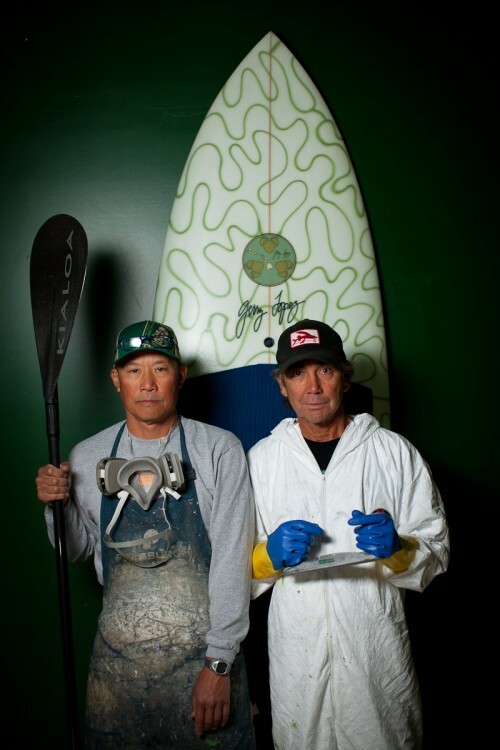 Throughout the design of the Hulu race paddle, Dave Chun and Gerry Lopez had conversations and collaborated. Throughout that process, the plan to eventually create a GL Surf paddle series stayed constant. The design was born of many ideas coming together. Dave Chun and Gerry Lopez collaborate and noodle around designs and ideas regularly. I’m not sure if Tom Carroll is aware of his influence on the design of the GL Surf Series but the collaboration with Gerry was constant. Both Dave and Gerry recognized that what Gerry needed in a surf paddle, “everyman, the regular surfer” might not need the same thing. I thought it was really fascinating to hear (in the video below) about the symmetric profile on the top and bottom of the paddle. If you cut across the paddle’s width you would get a profile in a squished diamond shape. The reason it is the same on both sides is because SUP surfers brace both on the front side and on the back side of the paddle according to stance, style and the wave. The paddle has the same hook found on the Hulu Series design because Tom Carroll and Gerry both wanted that element in a surf paddle. Even though Dave has had a lifetime of shaping paddles with economy of function and beautiful aesthetic form, he listened to the customers and their experience during the design process of a new sort of edge for the GL Surf series paddle – it is more rounded and wider than the Hulu race paddle. The fatter edge was tough for Dave to design at first, but testing proved that the rounder, soft, “fat” edges would protect the board without jeopardizing performance. The KIALOA Paddles Hulu race series of paddles will soon be joined by the Hulu surf series. There will be a soft release of the 8″ blade (similar to the KIALOA Methane) in the GL Surf series in 2013 – I know, I am drooling for it too. Over the 2014 year a number of other widths, from 8.5″ to 7.5″, and shafts are scheduled. 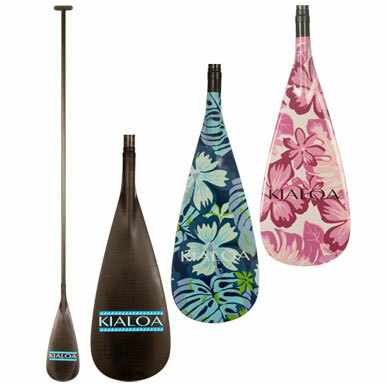 KIALOA Paddles is determined to provide excellence at each price point, from the CST to the fiberglass shaft option. If the KIALOA name will be on the paddle, slow and careful design and testing by elite and regular paddlers must come first. It’s one brand in our SUP life. It’s also a great example of how and why we select the brands we do. Ah, love is in the air – it’s May and warm – but better yet, salt is in the air. Ed and I are on Maui just as weather at home is figuring out how to move from winter to spring. We are a salt-craving duo. I started surfing in 1965 with the same guy I am surfing with now. Yup, heading into our 43rd anniversary we’ve still got the love. That said, I must confess a new crush – a wild and wonderful new crush on something fresh, sleek, sporty and fast – the Naish Hokua 9’0.” So, here’s the story. My surfer guy, Ed, and I had a 40 year hiatus from surfing and re-discovered our love of walking on water in 2005 as we launched into standup paddling – and surfing. Now it’s May and we’re on Maui prepping for the tradition and adventure of the Olukai Ho’olaule’a. Ho’olaule’a – literally, it means “celebration”, according to Olukai, it’s also an expression of gratitude. We feel that way as well. Since enjoying the small, “fun,” version of the Ho’olaule’a last year we have had the great fortune to meet so many great friends, professionals and athletes connected by Maui’s culture and events. What a treasure. The team at Naish Maui Pro Center stands out as a key part of what has made the experience what it is. Talk about in-depth experience, passion for their respective board sports and endless patience for questions and sharing advice – and that is just the tip of the iceberg. Have you ever rented SUP equipment during a vacation? It can be a real grab bag of choices. Many times we’ve headed out with less-than-amazing equipment, heavy paddles and a wave good bye once the credit card has been swiped. The team at Naish Maui Pro Center lives a very different vibe. Martin never stops smiling as he fine tunes and repairs the rental fleet maintaining tip top condition and appearance. Sam has a knack for considering our abilities and matching that to the breaks that could provide us the best experience on any given day. Jay is obviously proud of both the retail and rental aspects of the shop, as well as the culture that’s been developed. It was fun to chat with a few Naish riding Maui locals out at the break as they inquired where we got our Hokuas. The moment we said, ” We rented them over at Naish Maui Pro Center,” they immediately shared a similar story or two. Be prepared to be an SUP kid in a candy store at the Naish Maui Pro Center. Rack after rack of Naish board choices spread as far as the eye can see. There’s something for every ability and size. It was there in front of the area holding the Hokua line that I saw it – the Hokua 9’0.” I surf an 11’3″ all round board and love it – but sadly, it couldn’t hold a candle to this sleek and snappy Hokua calling my name. Heck, at my age (63) and my surfing ability (you’ll see in the video) would I be able to stand on it, balance and even catch a wave? I didn’t care, it was too beautiful not to take as my board of choice for surfing this week. Take a look at the 1-minute video collage of an afternoon of glassy awesome-ness at Launiupoko. In love there is always “that moment!” While I had plenty of fun rides and better bottom turns than I’d ever enjoyed, there was that moment of connection. A larger than usual set had come in with a chest high swell rather than the thigh highs of the day. 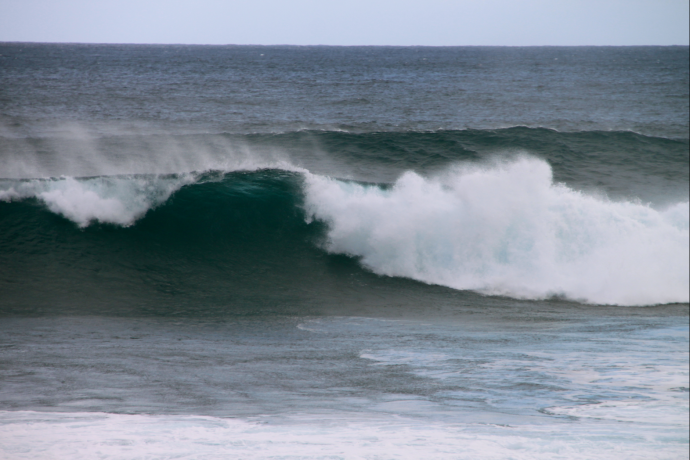 This glassy wall peaked in front of me and the lip took a sudden and crushing fold down, breaking right in front of me. I dug in my paddle and braced, expecting to the be tossed in the drink. HA! Not so. That Hokua easily broke through the wave, the power of the crest whipped past my ankles and I did this quick turn, and (SURPRISE) caught the next wave in the set. We’ve seen the pros make the Hokua perform. How cool that it can bring even the novice to a new level of SUP fun! Some background: I am just a regular person doing a little surfing, touring, racing, and recreational paddling. I could get one paddle that is versatile enough to do most everything, or I could start to build out my quiver of more specialized standup paddles. The size and shape of the blade, length of the shaft are just a few things to consider when choosing a paddle. Choosing a board is even more complex and one size for all types of water and surf or purpose gets complicated. I always go to an expert for advisement when making a decision about sports equipment and SUP equipment is no different. Sometimes people ask me, “I am just a recreational SUPer. Why do I need an expensive paddle?” First of all, “expensive” is a word that’s not easy to quantify in terms of comfort, freedom from injury, pure enjoyment, efficiancy and “feel” while enjoying your sport. Being up on the right board is so much better than being dunked with a “faster’ but maybe less stable board choice. I was talking to Steve Gates, owner of Big Winds in Hood River, Oregon a few months ago. We were discussing which Naish board I should use for an upcoming down winder on the could-be-gnarly Columbia River. We discussed balance, ability, glide and surfing. He advised me to use the Naish Glide 12′ 6″ which is forgiving and competitive (even if I am not so much). I had wanted to try the Naish Javelin (14′) like a friend has and one I have enjoyed in the flatwater. I thought that the faster the better was a good idea. Steve explained that I would be more stable and endure fewer swims – and therefore enjoy the race more and probably be faster with the Glide. Great equipment and great advice make all the difference for an enjoyable experience no matter where you finish in an event. Either way, Naish was the hands down choice. When out on the water, talk to others who share your interests – even if their abilities far surpass yours (for now). Try their equipment. If you have a heavy, poorly designed paddle prepare to get paddle-envy. If your paddle is not the right length, prepare for a huge “aha” moment if you try a paddle better suited to you. If you have a few members of the family who’ll be sharing one paddle, why not get a top of the line adjustable paddle that will be exquisite fun for all? The KIALOA Pupu paddle is a fine example. So why am I about to add to my quiver of standup paddles? I have one paddle I dearly love. For 5 years it has taken me over lakes, streams, oceans, bays and rivers – but like any piece of well-used sports equipment, it could break at some point. So I went shopping. Don’t ask me about square inches of blade size, blade shape, shaft length or blade design – I leave that to the experts. Discussing things with the team at KIALOA (awesome customer service and rich online information) I learned that for my size, age and skill level I might find the KIALOA Pipes to be a great downwinder and flatwater paddle. It was fun to learn that many pros – even big strong young men – love the Pipes as well. There is plenty to learn about getting equipment right – again, I always defer to the experts. My current paddle, with a shorter shaft and larger blade size can still be my go to paddle for surfing. For my down winders and probably most races I may be better off with the Pipes. I tried the Pipes on the same 5 mile training run I have been doing for about 6 weeks, maybe 3 times a week. In my last race I noticed that my heart rate was a full 20 BPM more than I wanted. I decided to do some training closer to my “fat burning” zone, topping at 136 and some segments in my “aerobic” zone – which tops at 154 BPM. I have been doing my 5 mile loop with my older paddle so I know my speed per mile and my average heart rate at that speed. Yesterday when I used the Pipes my heart rate was easy to keep in the 125-140 BPM range. My fear was that the “feeling easier” paddling would result in a slower average speed per mile. Holy cow! I use Nike+ to measure my miles and gather my splits per mile – I was 12-18 seconds faster per mile – a full minute faster for the total 5 miles while the entire workout felt easier. It was also actually easier – as demonstrated by my reduced heart rate. For a 63 year old chick just playing at being an athlete this is both fun to explore – and an incentive to get that Pipes in my quiver very soon. The only tough decision remaining is which of the beautiful graphics do I choose – the blue or the green plumeria? Maybe blue to match my cool new Sweet Waterwear paddling top or my Hawaiian blue Tiare Tee.